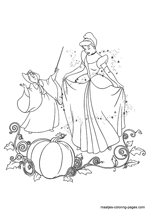 Cinderella is the much-loved only child of a widowed aristocrat. After deciding that his beloved daughter needs a mother's care, Cinderella's father marries a proud and haughty woman named Lady Tremaine. 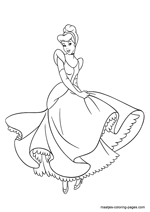 She too has been married before, and has two daughters by her first marriage, Anastasia and Drizella, who are just Cinderella's age. 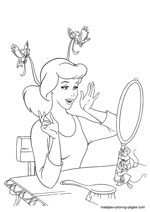 Plain and socially awkward, these Ugly Stepsisters are bitterly envious of the beautiful and charming Cinderella. 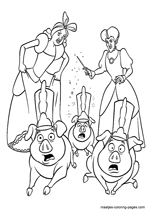 The family lives in happiness for several years, until the untimely death of Cinderella's father. After that, Lady Tremaine's true nature is revealed, and she and her spiteful daughters take over the estate, and begin to abuse and maltreat Cinderella, envious of her beauty. She is forced into housekeeping responsibilities and made to wait upon her jealous stepsisters like a maid. As Cinderella blossoms into a beautiful young woman who is kind despite her hardships, she befriends the animals living in the barn, including Bruno the Bloodhound, Major the horse, and many of the mice and birds who live in and around the chateau. Cinderella finds a mouse inside a trap, releases him, and names him Octavius, "Gus" for short. She is also friends with a mouse named Jacques ("Jaq" for short), the leader of a mouse-pack. At the royal palace, the King is angry that his son does not intend to marry. The King is determined to see grandchildren, so he and the Duke organize a ball for Prince Charming in an effort to cause his son to fall in love and marry, with every eligible maiden in the kingdom ordered to attend. When the invitation to the ball arrives, Cinderella asks her stepmother if she can attend. 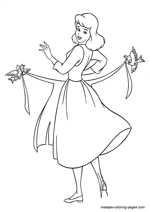 Her stepmother tells her she may go to the ball, if she finishes her work and can find a suitable gown. 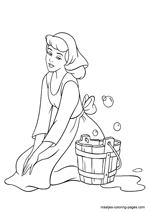 To consume her time, her stepmother sets Cinderella with a mountain of chores. Her mouse friends Gus and Jaq use Cinderella's stepsister's discarded sash and beads to fix an old gown that belonged to Cinderella's mother. 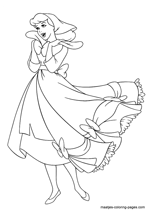 When Cinderella wears her dress before the ball, Lady Tremaine points out her daughters' beads and sash, and the jealous sisters physically assault her, tearing the gown to shreds, leaving Cinderella to run to the back of the garden in tears while her stepfamily attends the royal ball without her. 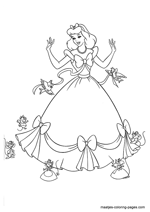 Cinderella's Fairy Godmother appears to her in the garden, and transforms her appearance for the ball. She transforms the mice into horses, Bruno the dog into a footman, Major the horse into a coachman, a pumpkin into the carriage, and transforms her torn dress into a beautiful blue dress with glass slippers. 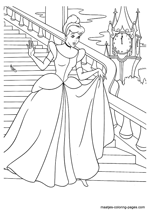 Cinderella departs for the ball after the godmother warns her that the spell will expire at the stroke of midnight. 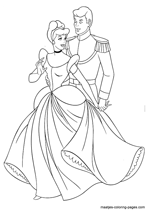 At the ball, the Prince rejects every girl, until he sees Cinderella, with whom he is immediately smitten. The two dance throughout the castle grounds until the clock starts to chime midnight. Cinderella flees to her coach and away from the castle, accidentally dropping one of her glass slippers. After the Duke tells the King of the disaster, they plan to find Cinderella with the slipper they found during her escape. 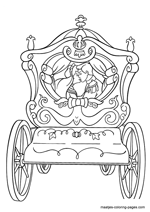 The next morning, a royal proclamation is issued, stating the Grand Duke will visit every house in the kingdom to find the girl who fits the glass slipper, so that she can be married to the Prince. When this news reaches Cinderella's household, her stepmother and stepsisters begin hurriedly preparing for the Grand Duke's arrival. Cinderella, overhearing, begins dreamily humming the song from the palace ball the previous night. Realizing Cinderella was the girl who danced with the Prince, her stepmother follows Cinderella up to her attic bedroom and locks her inside. When the Grand Duke arrives, the mice steal the key to Cinderella's room from Lady Tremaine's pocket and laboriously drag the key up the stairs to her room, only barely managing to free her after a fight with the Stepmother's cat Lucifer, in which Bruno comes to their rescue and scares the evil cat out of the house. Meanwhile, Anastasia tries on the slipper, but her foot is too big. 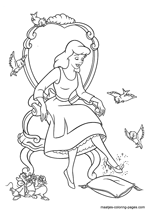 Drizella tries on the slipper, and finds her foot is also too large. As the Duke prepares to leave, Cinderella appears at the top of the stairs, asking to try on the slipper. Knowing that the slipper will fit and that Cinderella will marry the Prince, her stepmother insists she's just a servant girl. The Grand Duke sharply reminds her that every maiden is to try on the slipper. As the footman bring the slipper to Cinderella, her stepmother trips him, causing the slipper to drop and shatter on the floor. Cinderella then reveals she has the other glass slipper. Delighted at this indisputable proof of the maiden's identity, the Duke slides the slipper onto her foot, which fits perfectly. The two agree to keep the broken slipper a secret. At the wedding, Cinderella and the Prince descend the church's staircase, surrounded by confetti tossed by the King and the Grand Duke. Cinderella loses a slipper and retrieves it with the aid of the King. As the film ends on a scene of the two newly-weds kissing, the narrator concludes "...and they lived happily ever after".